This is the story about what one of the Marcus Today Members who used to work in a Collins Class submarine on weapons systems (computer whizz). When they surfaced, he would download stock-market data. When they submerged, he would spend many hours of idle time back testing numbers looking for patterns in share price movements to see if anything systematically worked. 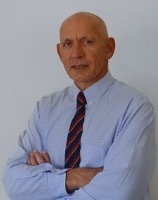 .....After a lot of backtesting on why he sometimes got it all wrong, on why the systems broke down, on why he got caught out by 'the market', he identified that corrections start fast, and you had to have an unemotional mechanical strategy that pulled you out early on the big market falls. 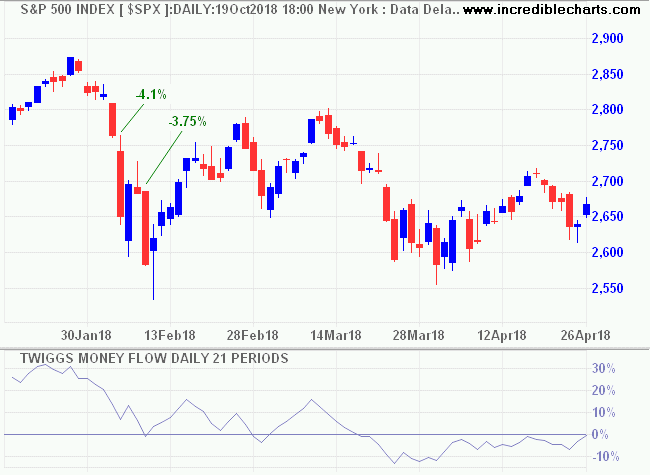 He developed a filter that overrode all the rest of his systems which said that if the US market ever falls 3% in a day you sell half of everything and, if it does it again, you sell the rest. Seems simple enough. 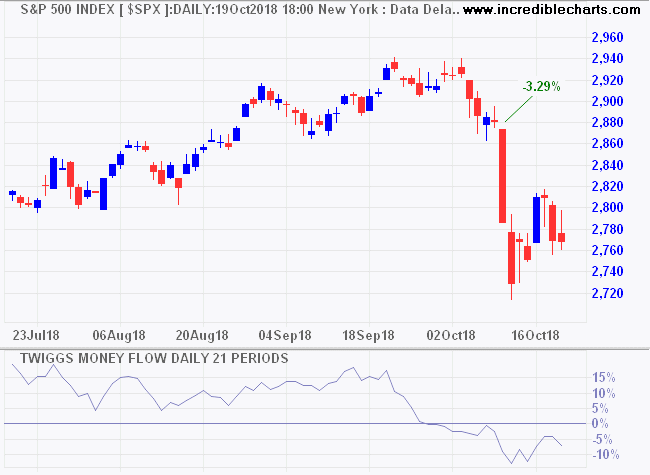 If we apply that to the current scenario, you would have sold 50% of your portfolio after Wednesday, October 10th when the S&P 500 fell 3.29%. But quick rules of thumb can be a fast way to lose your capital. Let's see how well the Collins Class Rule has performed in recent years. You would have sold 100% of your portfolio in January 2018, the last 50% at the absolute bottom. 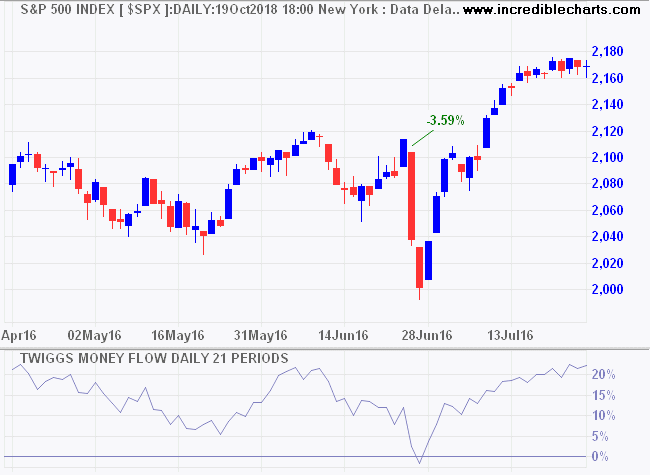 Fifty percent in June 2016 on the lowest day (you only sell after the close — on the next trading day). 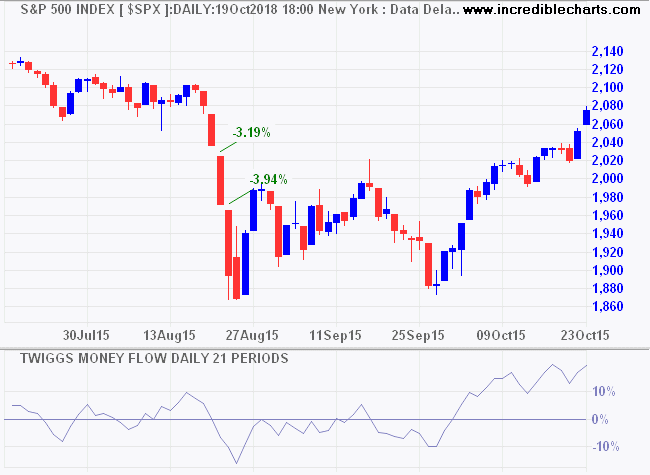 100% into the August 2015 low. 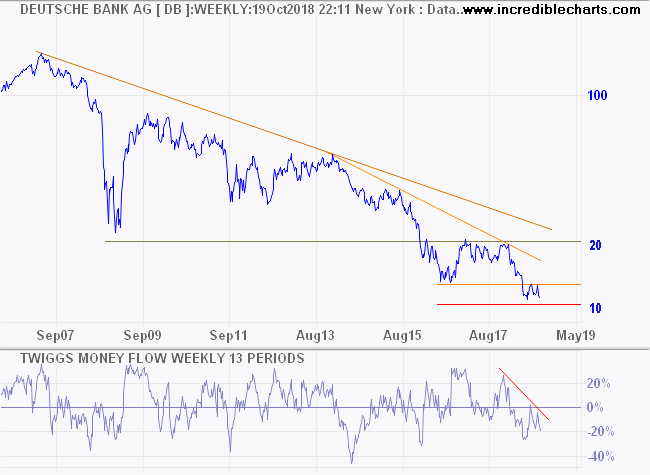 100% near the August 2011 low. 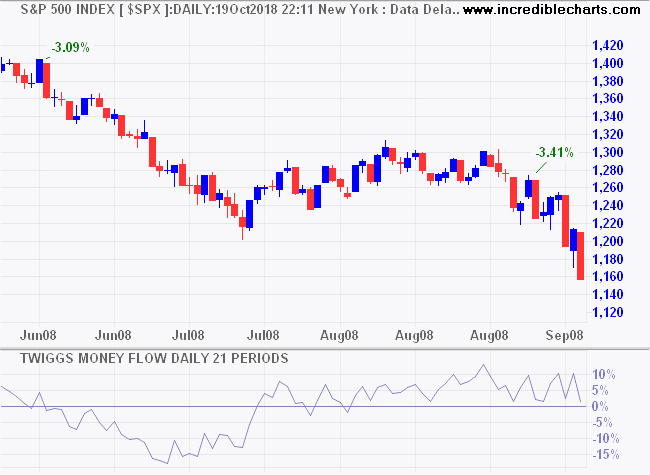 2010 does slightly better, exiting the portfolio in May, ahead of the July low. 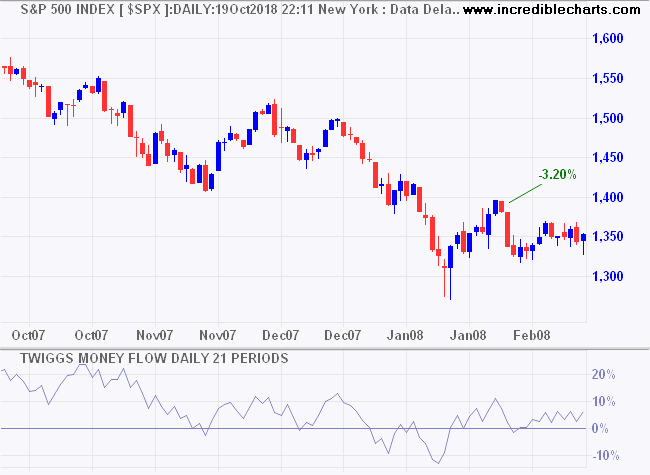 You would have sold 50% in February 2008 but probably re-entered your position in the subsequent rally. Before selling half in June 2008 and half in September ahead of the real crash. 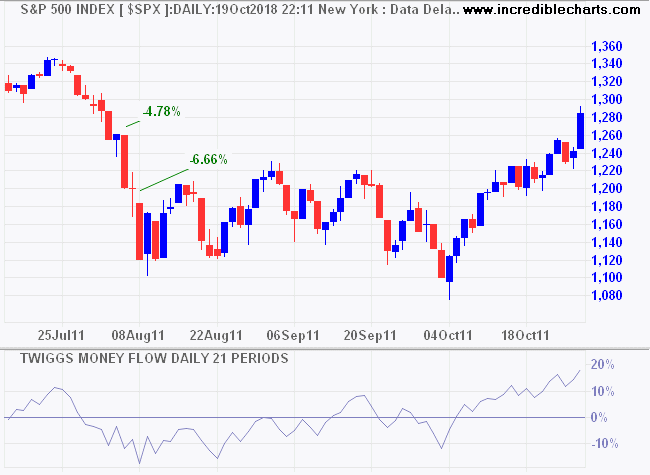 All of which goes to reinforce another of my rules of thumb: one in 10 corrections lead to a crash. And if you jump back in too quickly, you are likely to get caught by the real crash. As I see it, here are the arguments for and against a market down-turn. The Fed is steadily raising interest rates and shrinking its balance sheet. A tariff war with China could upset global markets. Europe is looking shaky because of Brexit, Italy and threat of a down-turn in demand from China. 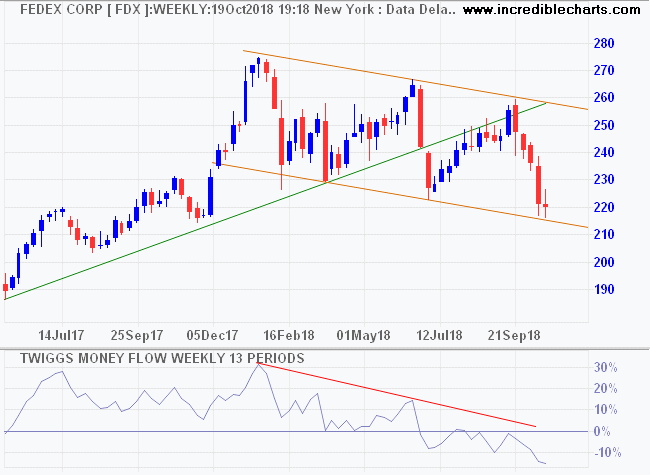 Bellwether transport stock Fedex is testing primary support, though a gradually declining channel, with several marginal breaks of support, more closely resembles consolidation than a down-trend. 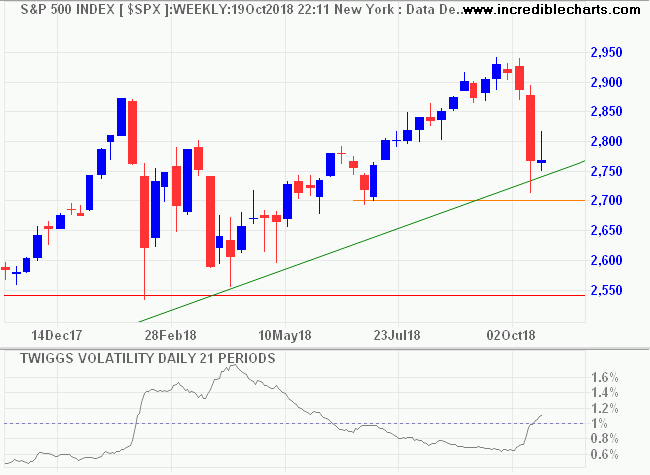 The earnings season is going well and S&P 500 volatility remains low. Only a significant trough above 1% would warn of elevated risk. 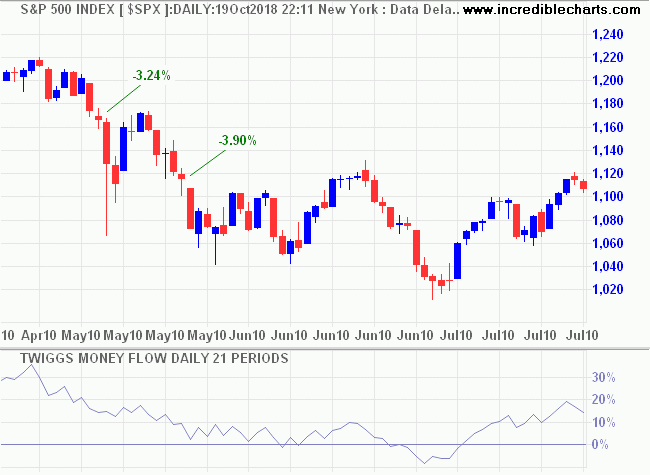 Selling pressure on the S&P 500 and Nasdaq 100 appears secondary in nature, with Money Flow holding above zero. 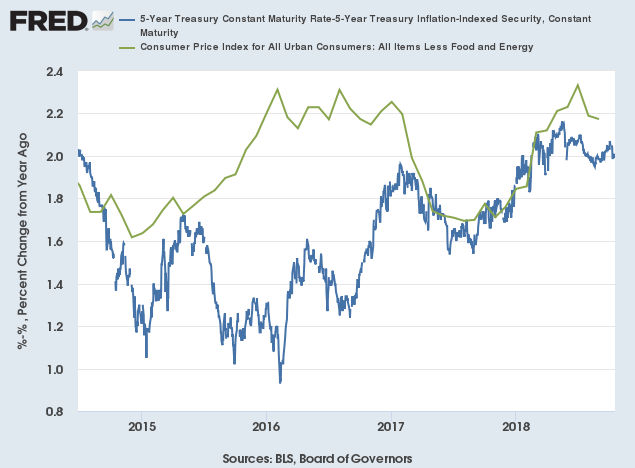 Inflation is low, with core CPI at 2.17% and the 5-year breakeven rate (Treasuries minus TIPS) at 2.0%. Real Treasury yields (10-year yield minus inflation) are near record lows. 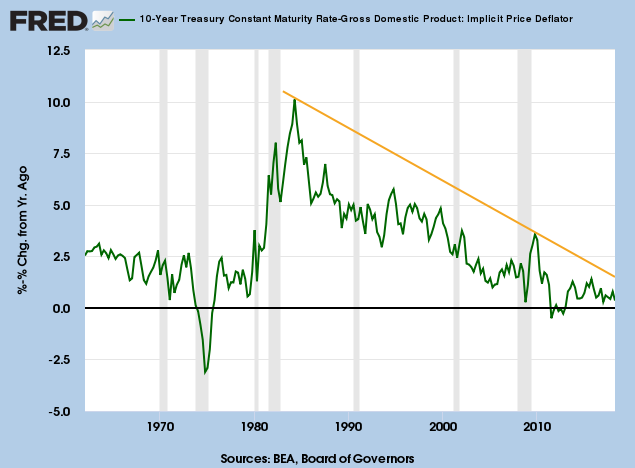 The yield curve is steepening, with the yield differential rising to 0.9% (a negative yield curve would warn of a recession). 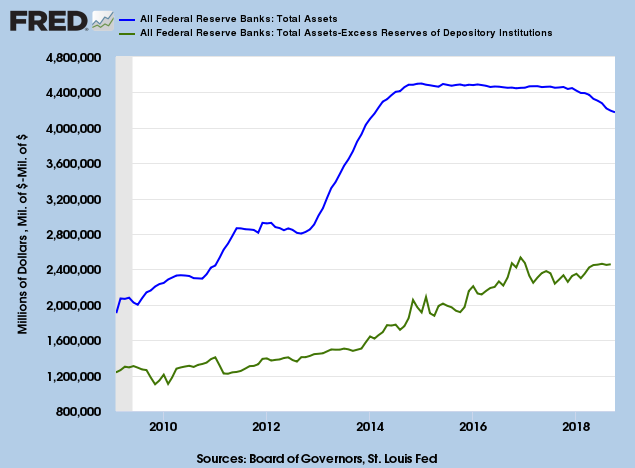 The Fed is shrinking its balance sheet, with Total Assets (blue line) declining, but excess reserves on deposit at the Fed are falling faster. Net Assets (green line) are rising as commercial banks withdraw Excess Reserves, meaning financial markets are still awash with money. 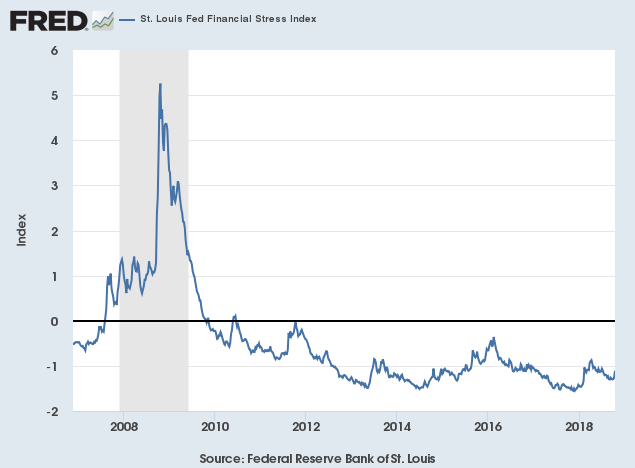 The St Louis Fed Financial Stress Index remains low. 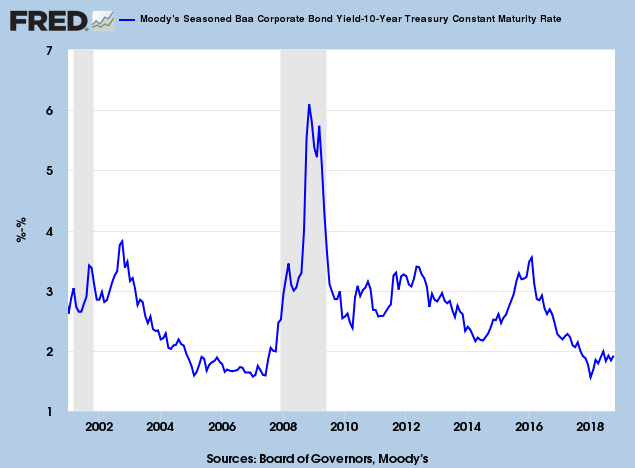 Low corporate bond spreads (Baa minus 10-year Treasury) reflect low lending risk. 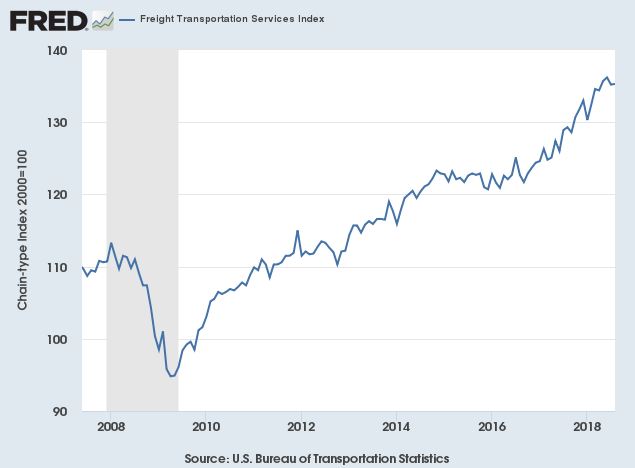 While the Freight Index, reflecting broad market activity, continues a steady upward climb. Economic growth is solid and financial risks are low. We just have to keep a weather eye on Europe which is capable of upsetting the party. I will leave you with another rule of thumb: no matter how good your research, there is at least a 10% chance that you are wrong. 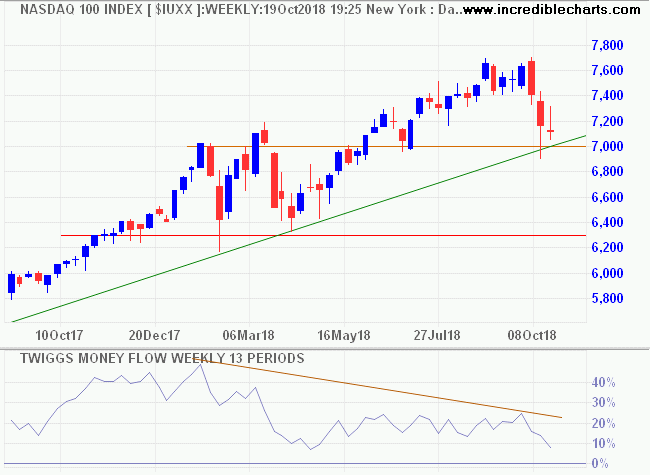 If you can't afford to ride out a market down-turn, stay out of equities. No matter how good your research there is at least a 10% chance that you get it wrong and may be forced to ride out the down-turn. If you sell late, you are likely to get back in late, maximizing your losses. Europe faces a stern test. Bear rally boosts Aussie miners. 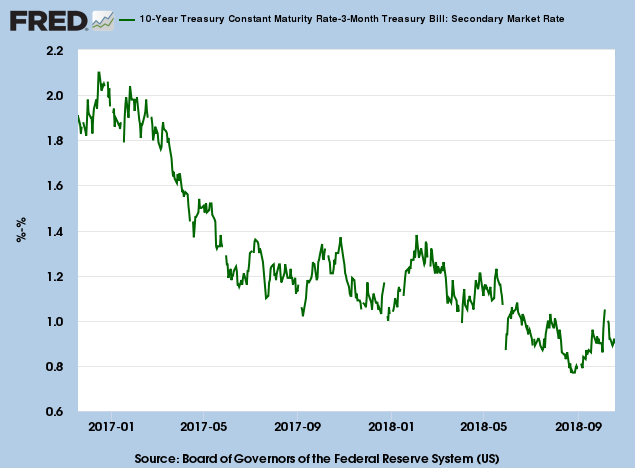 Treasury yields confirm bond bear market.